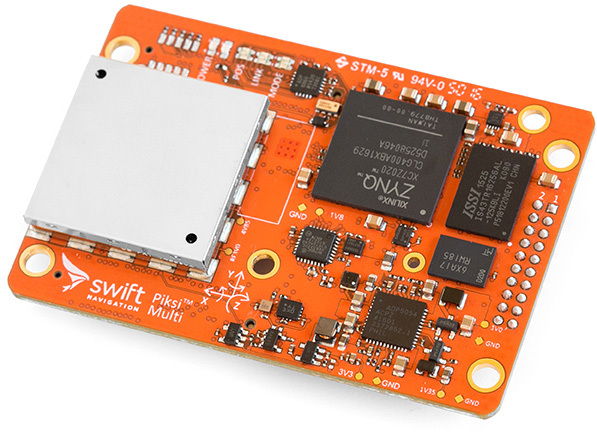 The Piksi Multi GNSS Receiver from Swift Navigation. Its dual-frequency operation offers fast RTK convergence times and reliable, centimeter-accurate results at a breakthrough price. Autonomous systems require precision navigation—especially those that perform critical functions. Swift Navigation solutions utilize real-time kinematics (RTK) technology, providing location solutions that are 100 times more accurate than traditional GPS. Multiple signal bands enable fast convergence times to high-precision mode. Single band RTK systems converge in minutes, while Piksi Multi converges to a high-precision solution within seconds. This allows for much faster system start times, as well as faster reacquisition, which is critical to robotic systems. Piksi Multi supports GPS L1/L2, GLONASS G1/G2, BeiDou B1/B2, Galileo E1/E5b for RTK measurements and positioning and SBAS for robust sub-meter positioning in non-RTK mode. Additional constellations create more robust positioning performance in a variety of challenging skyview environments. Integrated MEMS oscillator technology enhances robustness under vibration and shock. An onboard 6DOF, MEMS based inertial measurement unit allows customers to develop their own sensor fusion algorithm that enhances the positioning performance of the Piksi Multi. Piksi Multi is designed to be easy to use. The Piksi Multi Evaluation Kit includes: 2 Piksi Multi GNSS Receivers; 2 integrator-friendly Evaluation Boards; 2 GNSS survey grade antennas; 2 powerful radios and integration accessories. Piksi Multi features multiple high-density I/O connectors, providing a smooth and simple integration experience. Swift Navigation is built on the notion that highly-precise RTK solutions should be offered at an affordable price. Piksi Multi embraces the foundation of unmatched affordability and is available at a much lower cost than comparable systems. - Designed to provide a seamless easy-to-use RTK positioning experience through a single kit consisting of 2 Piksi Multi GNSS Receivers; 2 Evaluation Boards; 2 GNSS survey grade antennas; 2 powerful radios and all other required integration accessories. - Quick integration packs designed both for customers seeking to create custom RTK solutions for unique projects or seasoned RTK systems integrators. - Designed for the experienced systems integrator and the large volume enterprise customer. 1 SBAS Support includes the United States-based Wide Area Augmentation Systems (WAAS), the pan-European Union-based European Geostationary Navigation Overlay Navigation System (EGNOS), the Japanese Multifunctional Transport Satellites (MTSAT) Satellite Augmentation System (MSAS) providing coverage for Japan and Australia and the GPS-Aided GEO Augmented Navigation (GAGAN) regional system operated by the Indian government. 2 Current firmware supports 10Hz GPS L1/L2, GLONASS G1/G2, BeiDou B1/B2, Galileo E1/E5b low-latency RTK positioning or 5 Hz GPS L1/L2, GLONASS G1/G2, BeiDou B1/B2, Galileo E1/E5b time matched RTK positioning. 3 As required by the U.S. Department of Commerce to comply with export licensing restrictions. 4 Typical power consumption by module in RTK positioning mode. 5 The CAN implementation Bus on Piksi Multi is currently hardware ready and is electrically verified. We do not support any specific CAN output protocol (eg. J1939) and have no immediate plans to do so. To help customers design specific CAN protocols, we have plans to release open Linux documentation to help integrators implement their own CAN messages. 6 A hardware update on the Piksi Multi to use a higher grade CPU with better thermal characteristics was implemented, resulting in 0.4mm height increase of the Piksi Multi. Contact customer support for more information on this. 7 The use of an on-board heat sink may be required only in some rare cases. The module ships with a provided heat sink attachment. 8 In open sky and strong signals conditions. 9 Hot Start is the time taken by the receiver to achieve a standard position fix after a brief outage. For example, the time taken to fix a position for a car that is exiting a long tunnel. This can also be simulated by a simple RF on/off test with outages between 30 and 50 seconds. 10 Cold Start is the time taken by the receiver to achieve a standard position fix after a prolonged outage. For example, the time taken to achieve a position fix for a car that has been parked overnight in a garage and once it sees the sky view for the first time. 11 Re-acquisition is defined as the time taken to re-acquire position lock after brief moment of outage. For example, a car traveling under a freeway/highway overpass. This can also be simulated by a simple RF on/off test with outages between 1 and 5 seconds.